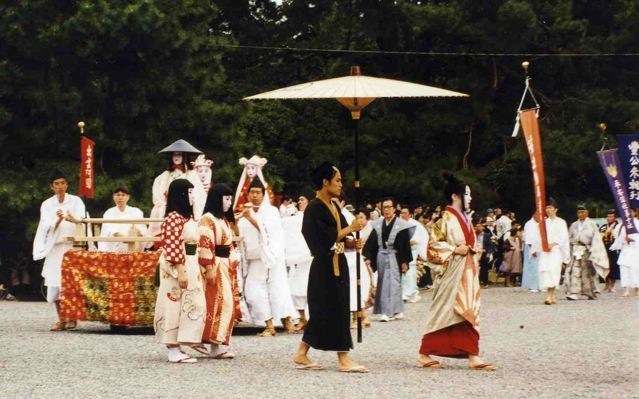 In 1999, Sally and I spent a few days in Kyoto 京都 to see the sights. We heard Kyoto was heavily influenced by Tang Chinese culture and retained much of that culture while few intact Tang dynasty relics remain in China today. Kyoto was built in 794 CE modeled after the Tang 唐 capital city ChangAn 長安, and was planned in a rectangular grid with wide avenues and residential blocks. While retaining much essence of Tang culture, Kyoto in the last 1,300 years has been rebuilt many times, mophing itself into very much a Japanese city with its signature refinement and subtlety. We visited the imperial palace in Kyoto where many generations of Japanese Emperors lived while Japan was ruled by the dictator shogun 將軍 or other war lords daimyos 大名. It was not until 1868 when Meiji Restoration put the Emperor back into power and he moved into the palace in Tokyo. 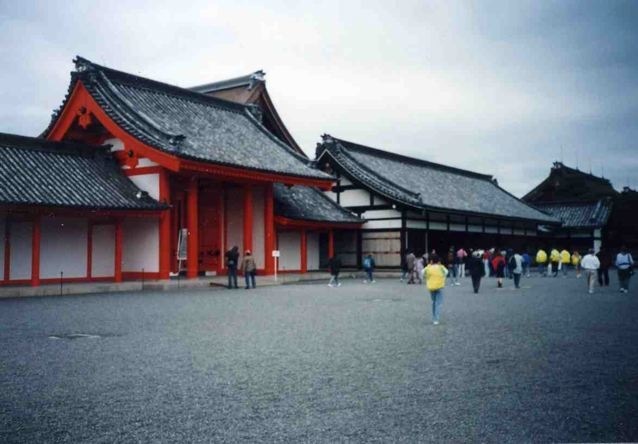 The Kyoto palace is a low keyed but neat compound with a small garden and limited living quarters. While the palace is in the quietly elegant Japanese style with unpainted wood and dark cypress bark roofs, the main gate is Chinese styled and painted in vibrant vermillion and white with a dark tile roof. By chance, the annual Kyoto Festival of the Ages was held while we were there. We found favorable position along the route and had a clear view of the parade at the beginning, and saw the participants mill around before they marched. Here, women shared some refreshment while waiting. 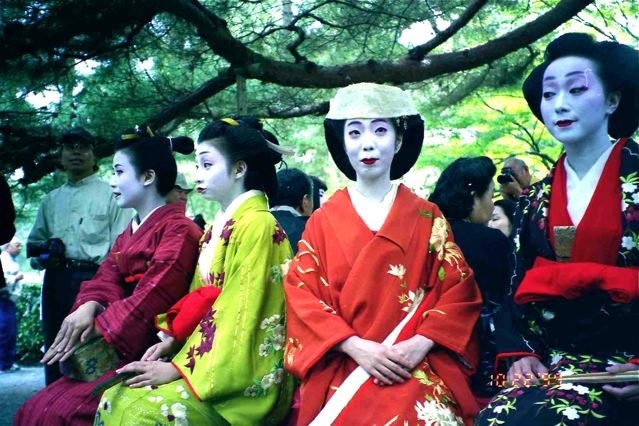 Women dressed in vibrant kimonos and painted white faces sat under a tree. One beauty out of four women is not bad. Participants in the parade have a picture taken beside an ancient styled cart. 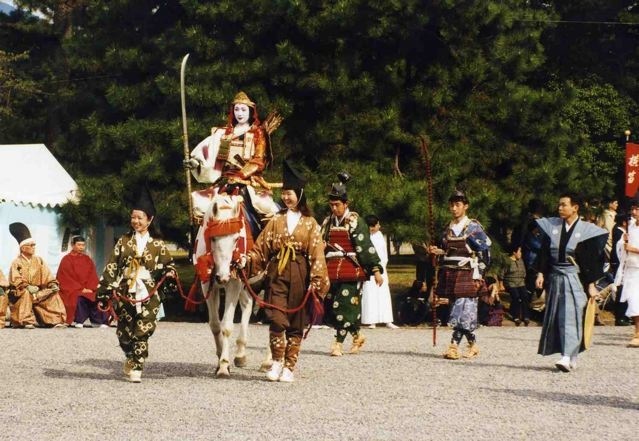 The Festival of the Ages celebrates the historic role Kyoto played in Japan’s history. 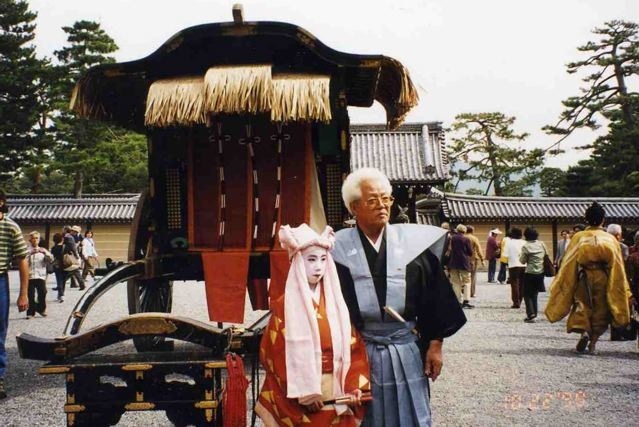 People earnestly dressed up in the costumes of various periods of Japan from 2,000 years ago to the more recent times. 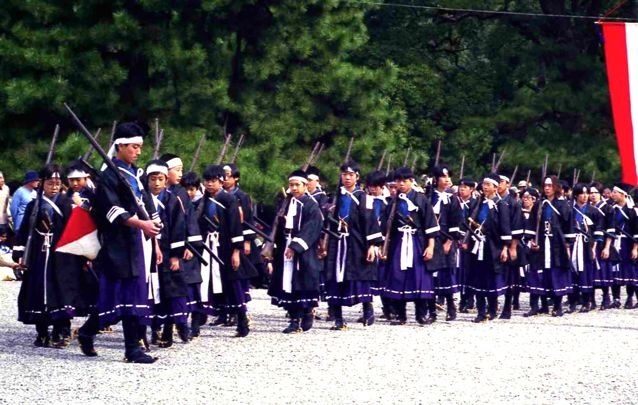 They dressed as princesses, escorts, samurais, soldiers, officials, and attendants. The costumes were beautifully made and apparently carefully researched to reflect their true appearances. Here, a lady covered in heavy capes is followed by ladies in waiting. 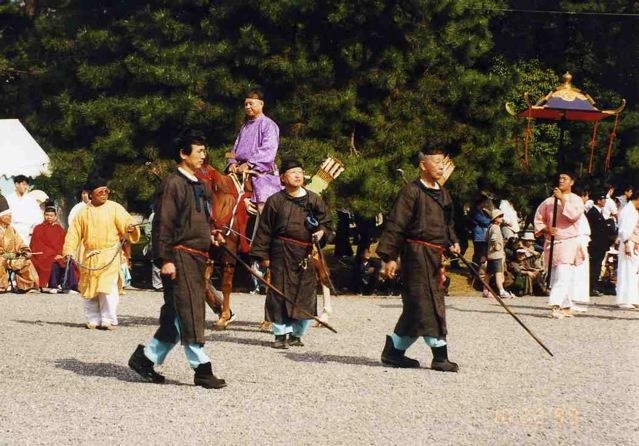 A civilian official is escorted by archers. An elaborate cart is pulled by an ox. Swordsmen soldiers were led by a commander and his retinue. 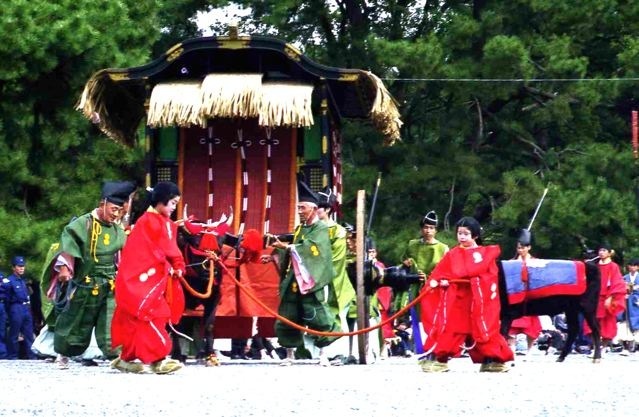 A women warrior is escorted by happy attendants. Conscript soldiers armed with flintlocks defeated samurais wielding swords. After the Festival, we took a trip and stayed in a country ryokan 旅館. We ate dinner served in our room, and slept on tatami set out on the floor. I had trouble finding space to put my knees during dinner. 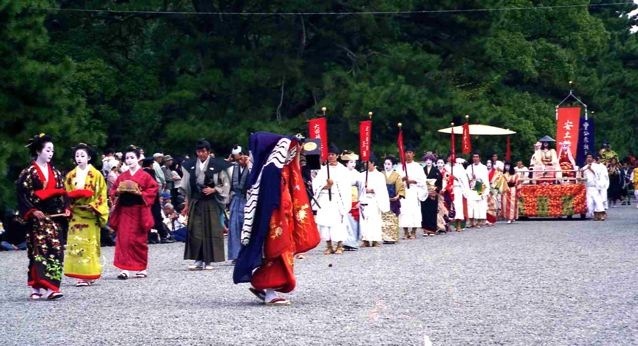 Luckily, we also caught another festival near Kyoto. We took a train to Kumara 鞍馬 to observe an annual fire festival. We got on the train at the beginning and found seats. As people rushed to get seats, a middle-aged man took a seat that a middle-aged woman also wanted. She showed displeasure and got him upset. He stood up, muttered something, grabbed her arm, and flung her in one motion. She did a pirouette and landed squarely in the seat, surprised but glad. The whole thing was comical and erased our image of Japanese social grace. The train ride was memorable, if scary. In subsequent 13 stations, more and more people piled in, assisted by pushers on platforms who literally shoved passengers into the packed trains. While we sat comfortably, standees were squeezed like sardines and leaned over us like dried ducks. When we thought the train could not take any more passenger, the pushers managed to cram a few more passengers into the cabin. The village of Kumara is a one-street village lined with houses in a narrow river valley. It was a lovely moonlit night and the village was buzzing with tourists. 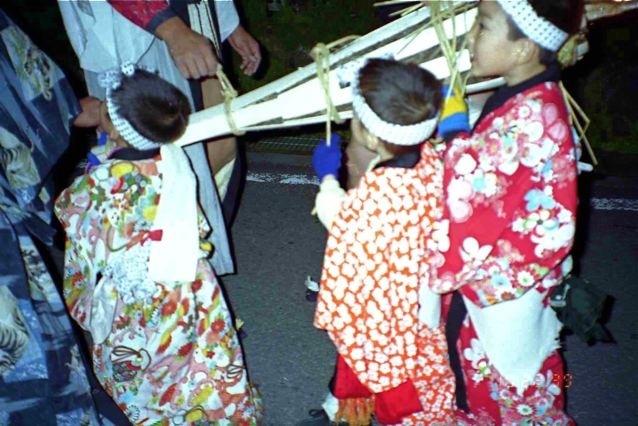 For this festival, each household would build a bonfire in front of the house. Some flames were so big they toasted and burned overhung leaves on the roadside trees. Then the men and boys of each household would carry a burning torch and run towards the temple at the end of the street, and throw the torch into a gigantic bonfire. Some men would be dressed in loincloth showing their bare butts, and some flaming torches were ten feet long. It was a pyromaniac’s dream festival, and it’s a wonder that houses did not get burned down or people scorched by the torches. 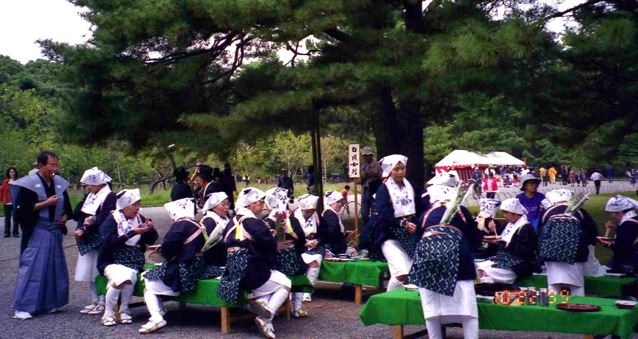 If you go to Kyoto in late October, you would have a chance to catch these two unusual festivals. In certain colder years, you may even catch the maple leaves turning brilliant red. We count this trip as one of the most memorable and fortuitous trips we made. Posted by Robert Wu on Sunday, March 1, 2009, at 3:37 pm. Filed under Uncategorized. Follow any responses to this post with its comments RSS feed. You can post a comment or trackback from your blog.